The patent, spotted by Ars Technica, is for a ‘Glove Interface Object’ presumably designed to work with the PlayStation VR (or perhaps a future successor). It appears to be a glove and bracelet with a sphere that looks not unlike what is perched atop the PlayStation Move controller, and it is designed to render finger and hand movements from within virtual space. The device is designed to have both flex and contact sensors to not only track the position of the thumb and at least one finger, but also recognize when they interact with each other. When rendered in virtual space, this means that players could put their fingers in a ‘gun’ position to fire a gun, or touch the thumb and pointer finger together to pick something up. 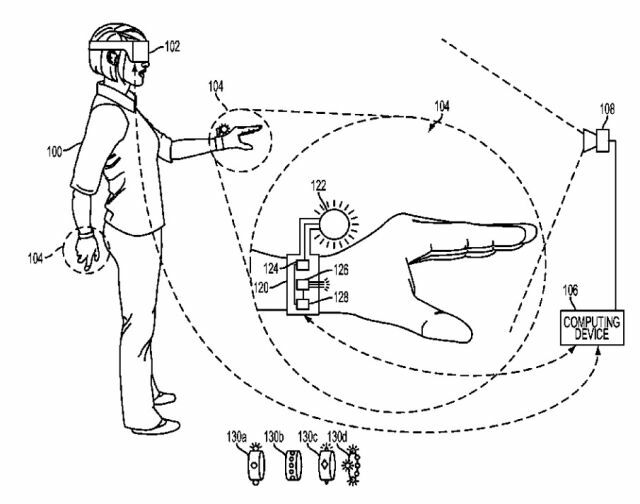 The application also says that haptics could be integrated into the device to provide feedback to the user. As with many patents, it’s unclear when (or if) a controller like this will see the light of day. But it does show how people who are working with VR are thinking critically about the kinds of gameplay the medium invites. It’s very clear that Sony and its competitors are chasing after ways to immerse users in virtual worlds, whisking them away to a new place and making them feel like they’re actually there. This space is getting really interesting.